I really like this film. 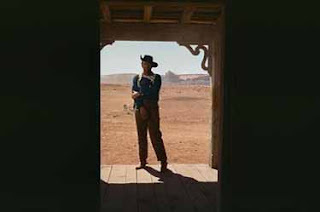 It is simply quintessential American cinema and easily one of the greatest westerns of all time. If anyone has the chance to hear the commentary by Peter Bogdanovich, I'd highly recommend it. I think it's easy to get caught up in the many dated elements of the film the first time through. I need to watch it again and sort of filter that stuff out. That said, I was fascinated by the fact that this was in many ways the first film that took on the cowboys and indians myth and suggested that it wasn't so clear who the savages were. Alan, this may help with that unexplined conflict that existed between Ethan and his brother. According to John Wayne in a 1974 interview, John Ford hinted throughout the movie that Ethan had had an affair with his brother's wife, and was possibly the father of Lucy and Debbie. This meant Ethan's thirst for vengeance stemmed not from the murder of his brother, but of the woman Ethan had loved. This was so subtle that many viewers at the time missed it altogether. its actually 5 years not a decade and Ethan is not "singular" on his trip he is accompanied the entire way Lucy and Debbie's adopted half-indian brother. Thank Anon for the corrections. 'Singular' was the wrong word, I think I meant to say 'Single-Minded'.